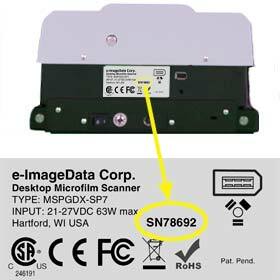 AUTO-Scan® Pro is desktop, automatic scanning software for 16mm, 35mm and cartridge(M) roll film that is optional software on the ScanPro i9300, 3000 and ScanPro 2200 Plus microfilm scanners. It has been on the market for over 8 years and is the desktop scanning software of choice used by libraries, archivist, genealogists, corporations, government agencies and service bureaus around the world. Users of this software report that it is easy to use, offers time saving features not available with any other software and has a track record of reliability. It is reported that hundreds of millions of microfilm images have been scanned using AUTO-Scan software. AUTO-Scan Pro is the fastest and most accurate desktop scanning software on the market. The optional AUTO-Scan Pro software uses intelligent algorithms for locating each image, straightening each image, cropping and removing unwanted borders. You can even elect to have each image adjusted for best brightness and contrast before the scan is automatically saved in the file type you have specified. No other scanner on the market can provide these capabilities. What is the difference between AUTO-Scan® and AUTO-Scan® Pro? AUTO-Scan® Pro adds Pro functionality listed above. It is important that you evaluate AUTO-Scan Pro with your own film. Some film is difficult to automatically scan and we want to make sure that you know how AUTO-Scan Pro works with your film before committing to a purchase. Just request a temporary license key from Stars Information Solutions to start your complete evaluation. There is a no refund policy on AUTO-Scan Pro when you make a purchase so the evaluation step is very important. AUTO-Scan Pro is the fastest and most accurate desktop microfilm scanning software on the market. The AUTO-Scan Pro software uses intelligent algorithms for locating each image, straightening each image, cropping and removing unwanted borders. You can even elect to have each image adjusted for best brightness and contrast before the scan is automatically saved in the file type you have specified. No other scanner on the market can provide these capabilities.